Fertilizing lawn is often a misunderstood concept, so we will actually cover the dictionary definition here shortly. There is a lot more to it than a bag of pellets you spread on your lawn a few times a year. This how-to section will help you understand a few basics of when, and why fertilizing your lawn will be benefit you. We will also throw in a few tips on how to do it. If you are not familiar with Dream Yard, we are an educational site, not a step by step site. We always try to take a unique approach with our topics covering information that you won't typically find on other sites. We believe homeowners benefit from understanding "Why" things are done, instead of just how to do them. If you have just arrived on our site, welcome to Dream Yard. You are in one of our mini-modules of the lawn care and maintenance series. The rest of the links for this section are at the bottom of the page. Fertilizing is an important aspect of proper lawn care, and when lawn fertilizer is used properly it will help you achieve a beautiful, thick, green lawn. We also realize it has been misused as a “cure all” for lawn problems. The reasons for fertilizing should be for maintenance and improvement, rather than for repair. Fertilizing lawn can also have a negative effect, leading to more problems of not done properly. Before buying fertilizer or applying fertilizer to your yard, you should first understand your grass type and soil conditions. People often waste money on expensive chemical treatments and fertilizers when their problems could actually be soil related. It could be a lack of good quality soil (Organic content), improper pH balance, or lack of proper soil depth. There is a lot of information about grass fertilizer which can be complicated or confusing at times. Let's start with a few definitions and keep things simple. Fertilizer - Any material put on, or in the soil to improve the quality, or quantity of plant growth. With this definition in mind, fertilizer is more than some pellet's in a bag, so let's look at the different products you can use to fertilize lawn. Slow release fertilizers. Sulphur coated urea, animal manure, bone meal, poultry waste, corn gluten meal etc. These are slower release fertilizers, and have less of a chance of burning your lawn. The nitrogen releases slowly and gradually, requiring fewer applications over the year. Granular fertilizers are the easiest to spread with broadcast or drop spreaders, making them the most popular. Organic varieties are increasin in popularity, but have to be further broken down by the microbes in the soil. This makes them one of the slowest acting fertilizers. They are also less effective in colder weather, as microbial activity slow as well. Fast release. Ammonium nitrate, ammonium phosphate, potassium nitrate, and potassium chloride. These are inorganic in nature and are very fast acting. They do not rely on microbial activity to be broken down. They have more of a tendency to burn, and require more frequent applications. They also require more frequent mowing and watering. These can leach into the water system if you are not careful. The three main ingredients in lawn fertilizer are: nitrogen, phosphorous, and potassium. The numbers on the bag represent their percentage by weight. In addition to these three ingredients, there can also be pre-emergent weed control additives for early spring applications. (They prevent germination) These are slightly different than "weed and feed" products for fertilizing lawn. Weed and feed is used when weeds are actively growing with your grass. There are other elements in the bag that are required for your lawn that we have not covered. If you require more advanced information about these other elements, visit the links at the end of this module. Understanding your pH levels will allow you to make adjustments to your soil, that will make fertilizing lawn more effective. The pH level is basically a scale numbering system used to measure if your soil is alkaline, neutral, or acidic. Seven is considered neutral, below seven is acidic, and above seven is alkaline. Most grass usually grows well with a pH level of around six or seven. Much of the eastern US and Canada that experience moderate amounts of rain, tend to have a more acidic soil. Dry areas of the southwest tend to have a more alkaline soil. This is known by most people but, did you know that your soil type can actually vary in different parts of you own yard? This is why experienced gardeners frequently test their soil. They don't want to waste money or use the wrong product. Just like a good doctor won't prescribe medication without a proper diagnosis. 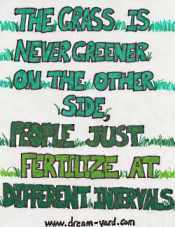 Fertilizing lawn effectively should follow this same principle. Why does my lawn not look like as good as my neighbor's lawn after I did exactly what he said? As a landscaper, I get asked a lot of questions about the color differences, and the quality of lawn from one yard to the next. This is what inspired me to come up with this quote. No two lawns are alike, and there are reasons why they respond differently to fertilizer applications. Don't take your neighbors word for what they think your soil conditions may be, and what fertilizer you should use. You might not even have the same variety of grass. They may have purchased their soil from a different supplier than you did. I have landscaped yards in new subdivisions working directly beside other landscape companies. We have compared the soils, and they can have a different composition and pH level. It is important to test your own soil before fertilizing lawn, and from different areas in your yard if possible. Most garden centers sell soil test kits for do-it-yourselfers. They have instructions and are pretty simple to use. You can also have your soil tested with your local county extension service. There are also some pretty good programs on the internet. Solvita has a great website full of information on soil testing as well as composting. These products are very affordable, and can be easily shipped anywhere. They have a soil testing kit for home owner's and gardeners, called the Solvita Garden Care Kit. If your pH level is not in the correct range, applying lawn fertilizer can be a waste of time and money. The effectiveness of the fertilizer will diminish the further out of proper pH range you are. In other words, fertilizing your lawn will have reduced positive effects on the color or growth changes. You will also have reduced improvements of fertilizer if your soil is sterile. (Little or no microbial activity). This is another reason why top dressing is so important. This is the big question that everyone has, and we only have 1 answer. your variety of grass, when it needs it, and all the rest of your lawn care methods, so we better look at a few before we get into when to fertilize. Any advice on fertilizing should only ever be considered a general guide. If your lawn is thriving, healthy, and has good colour, you can cancel a scheduled feeding, or hold off for a couple of weeks. Treat it like your body, and only give your lawn what it needs. Different varieties may also have different requirements. It's a good idea to know what type of grass you have, so you can fertilize accordingly. Fertilizer should be applied when your lawn is actively growing. If you have a healthy lawn you may only require two applications in a year. One in the spring, and once in the fall. The fall is the most important application for cool season grasses. Most people will develop their own schedule depending on their grass type, but two applications is sufficient for most varieties. 3 is also OK, but 4 is leaning on the too much side. Once again, it depends. Mulching your clippings to break down in the grass will feed nitrogen, phosphorous and potassium back into the soil. Studies show that this can reduce your need for fertilizer by as much as 30%. If you follow proper lawn care methods, you will not build up thatch in your lawn by leaving the clippings. Recycling grass clippings will also help the microbial process in your soil. This is like a mini-composting system. If a fast growing lawn is a concern, you can alternate bagging and mulching every second mow. A very fast growing lawn, may be an indication that you are watering excessively, or applying too much fertilizer. This is typically a more common problem with quick release fertilizers. Overfertilizing can weaken the overall health of your lawn with rapid growth of the grass blade. This results in a root system that can't sustain the growth of the blade above it. If your lawn is recovering well in the early spring from the previous fall application, you may want to delay or cancel a spring application. Warm season grasses may be ready to feed as early as February for the first application, giving it a nice 'get started' boost to help strengthen the roots. If you have weeds, you can use a fertilizer with a pre-emergent additive before they are actively growing. Do not use pre-emergents if you plan on doing any grass seeding. It will kill and prevent germination of the grass seed along with the weed seeds. You can do the same for cool season grasses usually between March and May depending on your climate. Wait until it starts to actively grow, and don't forget your fall application helps your lawn get started in the spring. Warm season grasses can again be fertilized, giving it a boost while it is actively growing. If you have broad leaf weeds also growing, you can treat your lawn with a weed and feed fertilizer. You can also do this for cool season grasses if it needs it. (Usually in May or June.) The growth of cool season grass will slow considerably during the hot summer months, and a good boost just before summer will help your lawn resist the heat and drought. This is also the time to set the mower height a little higher in preparation for the summer heat. Warm season grasses have active growth from spring right through until fall and a summer application will help fight the summer stresses of heat, drought and foot traffic. Generally, cool season grasses do not grow that much in July and August, and applying fertilizer is not necessary. It often depends on your climate though. Some people have a light application on cool season grasses in the late summer just before fall. This can help your lawn recover from stresses of summer heat. Living in a northern climate you will have shorter spring and fall seasons. You may skip this late summer application, and only go with one fall application. We mentioned before that it helps to know your grass type. For those with Bermuda grass, you may want to consider an extra application in the summer months as it tends to like more nitrogen than other varieties. These are the most important feedings of the year for the cool season grasses. These grasses start growing more vigorously when the temperatures and conditions improve. Fall feedings help prepare it for the next spring. Fertilizing lawn in August to November helps strengthen the roots before the frost hits the ground (six to eight weeks before the frost is recommended). Most lawns require about one pound of nitrogen for every 1000 sq. ft. or so. Having a spreader with adjustable settings is a great help. You will find instructions on most fertilizer bags to help you set your spreader to the right adjustment. Make sure the type of grass you have is compatible with the kind of product you are using. (Weed and feed should not be used on all varieties). Fertilizing lawn should usually be done when it is dry. Weed and feed is an exception, and should be applied to a wet or damp lawn. Keep an eye on the weather forecast, and don't fertilize with any products if you are expecting a lot of rain. This can be a waste, as well as an environmental issue as fertilizer can be washed away into the water supply. Please don't dump the fertilizer in the spreader when you are on the lawn. It can be easily spilled while pouring. Do it on the driveway, or a surface that you can clean it up from easily if you spill it. Making a small hole in the bag will also help. Fertilizer can sometimes clump up, and clog the spreader making for uneven distribution. Pour slowly and break up any clumps as you see them (use gloves). Wearing rubber boots is a good idea when fertilizing lawn, as it keeps the fertilizer from getting caught in your shoes and tracked into the house. With a drop spreader, do the perimeter of your yard first. Once you have the perimeter done, finish the inside by passing back and forth in strips. If you have a broadcast spreader, you may find it helpful to start away from the edge first until you have an idea how far the spreader is going to throw the product. This will help you from getting it in garden beds and other unwanted areas. Try to overlap previous passes by a few inches with a broadcast spreader. With a drop spreader just follow on previous wheel track, or a little inside of it depending on the spreader. I'm sure we all have seen the results of a poorly fertilized yard. If you want to ensure a more even coverage, cut your setting in half and go over your yard twice in different directions each time (at a right angle to the first pass). After fertilizing lawn, a light watering can be ok, but not to the point of causing runoff. This can wash the fertilizer away being a waste of money, as well as leaching it into the water system. Always read the bag before fertilizing lawn. There may be specific instructions to the product you are using. For example: Weed and feed may require a wet or damp lawn. Kids and pets should be kept off the lawn until you have watered, and at least 24 hours after. Some fertilizers with pre-emergents or weed and feeds will require a longer period. Read the bag for the recommendations of required times to stay off the lawn. Some people prefer to use liquid fertilizers that can attach to your hose. These can be very effective ways of fertilizing lawn, but I guess I am old school. The advantage of liquid fertilizers is that they give you instant results, but the effects are usually short term. Heavy rain and watering can also leach these away before it has been absorbed by the grass. Using organic fertilizers for fertilizing lawn is becoming increasingly popular. They have the same important nutrients as inorganic fertilizers, but it takes longer to see the results. They take more time to feed the roots, because they have to be broken down by the microbes in the soil. Using organic fertilizers and top dressing your yard with compost can lead to a much healthier lawn over the long term. It will also increase the number of microbes already present in the soil. This is a more environmentally friendly way to be, but it may take you a few seasons to get there. If you would like to know more about organic fertilizing please click on this organic link. It is an excellent site, with lots of valuable information including this information on organic fertilizers. Hopefully, you now have a better understanding of fertilizing lawn.